Synopsis: Love science fiction stories that all include elements ofLove, Murder & Mayhem? 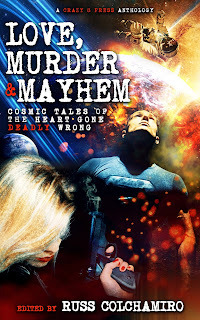 About the Editor: Russ Colchamiro is the author of the rollicking space adventure, Crossline, the hilarious sci-fi backpacking comedy series, Finders Keepers, Genius de Milo, and Astropalooza, and is editor of the new anthology, Love, Murder & Mayhem, all with Crazy 8 Press. Review: This anthology has a little bit of everything, you really can't go wrong if you love sci-fi! You'll laugh, have your heart warmed, and sometimes root for the bad guys. I won't lie there were a few times tears were brought to my eyes by a poignant tale, but there were just as many times that I laughed until tears spilled from my eyes. A great on-the-go read, one story at a time.